WTF FUN FACT #6107 SPREADTHAT! IS A SELF-HEATING BUTTER KNI - ProudMummy.com the Web's Community for Mums. WTF FUN FACT #6107 SPREADTHAT! 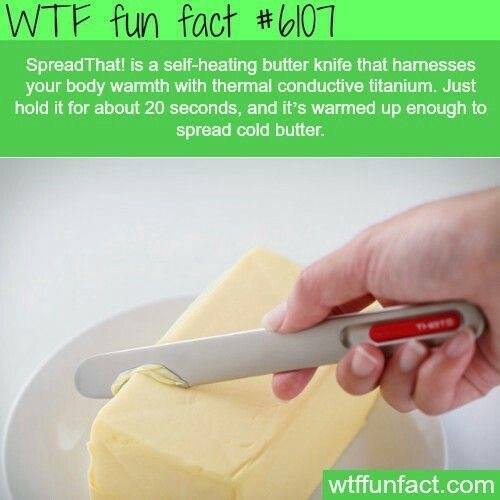 IS A SELF-HEATING BUTTER KNIFE THAT HARNESSES YOUR BODY WARMTH WITH THERMAL CONDUCTIVE TITANIUM. JUST HOLD IT FOR ABOUT 20 SECONDS, AND IT'S WARMED UP ENOUGH TO SPREAD COLD BUTTER.